Richard Wagner’s latest book is not about James M. Buchanan. At least not in the way you’d expect given the title: James M. Buchanan and Liberal Political Economy: A Rational Reconstruction. Wagner has written elsewhere that economics is a discipline that “deals with thoughts, not with things,”[i] and he has stayed true to that approach here, writing an intellectual biography that is about Buchanan’s ideas first and his work and person second. The result is a masterful work that invites both the experienced and the novice student of political economy to think about democracy, self-governance, and constitutional processes in new ways. 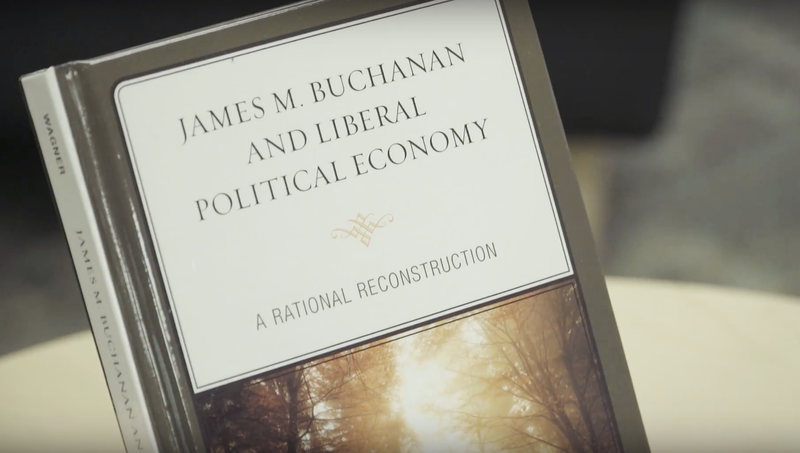 A rational reconstruction of a rich scholarly life like Buchanan’s is no simple task. The biographical pieces are the easy part. The hard part is absorbing a lifetime of scholarship by Buchanan — a heavy-hitting, extra pot of coffee, sleep-is-for-the-weak kind of lifetime — and then transforming that lifetime of scholarship into a neat 300-page presentation that delicately arranges all those decades of coffee and mimeographs into a cohesive theoretical frame. When the Scandinavian Journal of Economics printed Buchanan’s list of publications at the time of his Nobel award, the list included 23 books, 14 monographs, and an 18-page long list of articles, book chapters, and comments. [ii] That was only two-thirds of the way through his career. In short, Buchanan wrote a lot. This commitment to his craft shines through particularly in the appendix to James M. Buchanan and Liberal Political Economy and in my interview with Wagner, where he offers a set of more personal reflections on working with Buchanan than appear in the rest of the book. Wagner argues persuasively that the epicenter of Buchanan’s contributions to public choice and constitutional political economy is a humbly titled article published in 1949 in the Journal of Political Economy, “The Pure Theory of Government Finance: A Suggested Approach.”[v] In brief, the suggestion offered by Buchanan in that article is that theorizing about governments as if they are single-minded, organism-like abstractions with unified visions and plans is deeply flawed. Instead, governments are collections of individuals, each of whom have their own separate goals and plans, and who will often be in conflict with each other. Stated so plainly it seems obvious, as obvious as the existence of gravity or the fact that the earth revolves around the sun. The obvious does not always make it in to theory without a fight though, and Buchanan worked on developing this individualistic approach to understanding political organization for the rest of his life. The metaphor that Wagner suggests for thinking about Buchanan’s career as a whole is that of an oak tree, deeply rooted in his 1949 article on public finance and then branching out from that single seed. [viii] In Chapter 3, Wagner explains Buchanan’s constitutional framework, in which he studied how and for what purpose individuals might choose to bind themselves through the creation of rules, as emerging from this individualistic, democratic approach. Chapter 4 explores the extension of this constitutional approach into the study of political externalities, federalism, and competitive government. Chapter 5 discusses the way in which Buchanan incorporated notions of time into this theorizing, particularly through the study of public debt, a project in which Wagner himself was an important partner, for example, their 1977 book, Democracy in Deficit. [ix] Chapters 6 and 7 address the themes of ethics, liberty, and individual responsibility, with a particular focus on the way that these were integral to Buchanan’s theorizing throughout his life and represented important contributions to positive as well as normative projects within political economy. So perhaps the oak tree metaphor needs to be modified somewhat, or at least the idea that it grew for 64 years. Instead, the study of democratic public finance continues to grow today, through the work of Wagner and others who have sought to extend Buchanan’s research program. So long as research in public choice and constitutional political economy continues to generate meaningful insights into the social world, there will be plenty of sun, soil, and sky for the tree Buchanan planted in 1949 to continue to grow. [i] Wagner, Richard E. 2010. Mind, Society, and Human Action: Time and Knowledge in a Theory of Social-Economy. London: Routledge. [ii] Atkinson, Anthony B. 1987. “James M. Buchanan’s Contributions to Economics.” The Scandinavian Journal of Economics 89 (1): 5–15. [iii] Buchanan, James M. and Gordon Tullock. 1962. The Calculus of Consent. Ann Arbor: University of Michigan Press. [iv] See page 2 in James M. Buchanan and Liberal Political Economy. [v] Buchanan, James M. 1949. “The Pure Theory of Government Finance: A Suggested Approach.” Journal of Political Economy 57 (6): 496–505. Also see pages 42–46 in James M. Buchanan and Liberal Political Economy. [vii] See page 39 in James M. Buchanan and Liberal Political Economy. [viii] See page 25 in James M. Buchanan and Liberal Political Economy. [ix] Buchanan, James M. and Richard E. Wagner. 1977. Democracy in Deficit: The Political Legacy of Lord Keynes. Indianapolis: Liberty Fund. [x] Wagner, Richard E. 2016. Politics as a Peculiar Business: Insights from a Theory of Entangled Political Economy. Cheltenham: Edward Elgar Publishing. Lewis, Paul and Richard E. Wagner. 2017. “New Austrian Macro Theory: A Call for Inquiry.” The Review of Austrian Economics 30 (1): 1–18. Wagner, Richard E. 2012. “A Macro Economy as an Ecology of Plans.” Journal of Economic Behavior & Organization 82 (2–3): 433–444.